You know where students get stuck when you teach the quadratic formula? How about...like...the entire thing? This pre-read - for in-class, or homework! 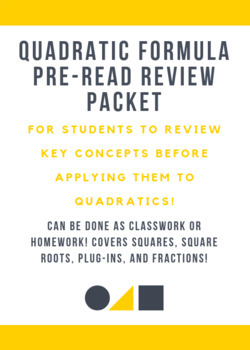 - covers some key places students may need to review before they're ready to use the QF. Students will review squaring numbers, finding square roots, plugging in values, and reducing fractions. Based on their experience/data/questions from this packet, you'll be able to pinpoint and prevent misconceptions when you get to the real thing!